The special operators of the Special Operations Command (SOCOM) have a history of being competent military members with deep beliefs and codes of behavior and confidence in their actions. 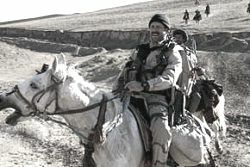 All members of SOCOM are dedicated warriors, but the Navy SEALs & SWCC, Army Special Forces, Army Special Operations Aviation, Air Force Pararescue and Combat Controllers, 75th Army Ranger Regiment, and MarSOC Raiders have developed a warrior ethos that demonstrates the type of person each is and who are sought in recruiting and training efforts. "In times of war or uncertainty there is a special breed of warrior ready to answer our Nation’s call. A common man with uncommon desire to succeed." "We train for war and fight to win" is another quote within the Creed that explains the mindset of the Naval Special Warfare warrior. The Navy SEAL Code is another written verse that includes words such as loyalty, team, and teammate. The underlying common denominator of Navy SEALs is the phrase, "Never quit." Navy SEALs have the mindset to "earn your Trident every day." Army Special Forces wear the Green Beret and are an elite fighting force for good all over the world. Understanding the enemy of our enemy's culture, the Green Beret is an invaluable force of eyes on the target. "I am an American Special Forces Soldier! I will do all that my nation requires of me. I am a volunteer, knowing well the hazards of my profession." "Service in the 160th is a calling only a few will answer for the mission is constantly demanding and hard. "And when the impossible has been accomplished the only reward is another mission that no one else will try. As a member of the Night Stalkers I am a tested volunteer seeking only to safeguard the honor and prestige of my country, by serving the elite Special Operations Soldiers of the United States." "Rangers Lead the Way" is the ethos of these elite ground fighters of the Army. This team of specialized, light infantry, parachuting war-fighters has been volunteering for the most dangerous missions since the beginning of our great nation. The word RANGER is spelled out in the six paragraphs of the Ranger Creed and completely describes what it takes to be an Army Ranger: RANGERS LEAD THE WAY! "It is my duty as a Pararescueman to save life and to aid the injured. I will be prepared at all times to perform my assigned duties quickly and efficiently, placing these duties before personal desires and comforts. These things I do, that others may live." The Air Force Combat Control Technician (CCT) Creed is: "First there." The Air Force Special Operations (Pararescue and the CCT) are highly technical special operators who serve as combat medics (PJ's) and forward-deployed air traffic controllers and communicators with air assets for ground support. The terms smart, humble, brave and tactically proficient accurately describe these quiet professionals. "In our nation's time of need, an elite brotherhood of Sailors stands ready off distant shores and on shallow rivers. Defending freedom, they serve with honor and distinction. I am proud to be one of these Sailors." "I am a Special Warfare Combatant-craft Crewman: a quiet professional; tried, tested and dedicated to achieving excellence in maritime special operations. I am a disciplined, confident and highly motivated warrior."